Two Moray community councils have teamed up to save a dump earmarked for closure by the local authority. Plans to shut Gollachy Recycling Centre in Buckie were announced as part of Moray Council’s budget cut proposals. However, locals are now battling to keep it open to avoid travelling longer journeys to find one further afield. 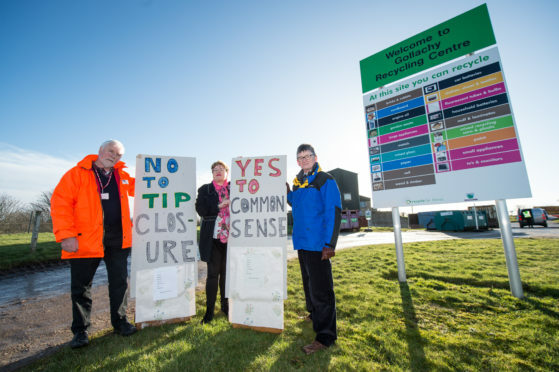 Members of both the Lennox and Buckie community councils held a protest outside Gollachy yesterday and launched a petition in the hope local authority bosses change their minds. Lennox community council chairman Colin Hanover said the decision “flied in the face of common sense”. He said: “Moray Council just recently announced they were going to charge residents to remove garden refuge but they are now proposing to close the alternative which would be to drag our stuff to the tip itself which is ridiculous. “Saying that they are going to shut this one and keep the Dallachy one open doesn’t help as it is further away. “This will put more exhaust fumes into the environment. It just flies in the face of common sense to close the only recycling plant in the area given that one of the highest priorities in today’s society is protecting the environment. 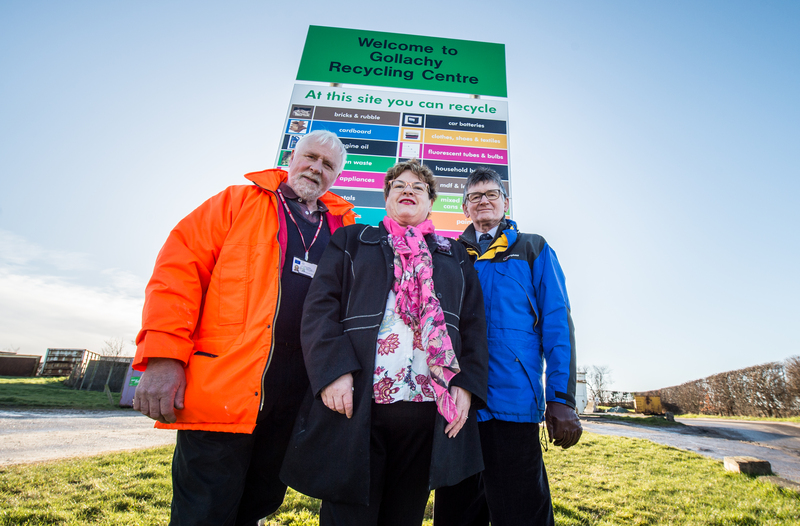 The Gollachy site is the only one of nine recycling centres operated by Moray Council currently under threat of closure. It is expected to cease operating in April 2020. The Dallachy site is near Spey Bay but is a smaller operation than the facility in Buckie. Fellow community council member Angus McNair, the leader of the campaign, said: “The decision to close the facility is once again a hammer blow to the people of Buckie and the area, who use the facility on a regular basis. “There has been no local consultation and no environmental impact assessment study on vehicle movements upon closure of the site. “The council have removed other services from Buckie and the area in the past and Elgin is left alone which is not fair. Buckie and District community council chairman Steve Thornton said: “Closing Gollachy is going to lead to more fly-tipping, which in turn will cost the council more to clean up. Moray Council leader Graham Leadbitter said: “The proposal on Gollachy is for closure in 2020 and it was looked at on a geographical basis, with the site being relatively close.